In storytelling, archetypes exist as powerful figures that consolidate certain universal human traits. While fashion designers work in tactile media such as paper patterns and cloth rather than in the written word, they are nevertheless storytellers using symbols that carry valuable, non-verbal information. A Queen Within – Adorned Archetypes takes this insight as a fertile starting point from which to explore how contemporary fashion designers engage with seven female archetypes—each unique in her strengths, weaknesses and significance. These seven archetypes—Thespian, Mother Earth, Explorer, Magician, Enchantress, Sage, and Heroine—all stand as powerful wellsprings of creative inspiration, as well as opportunities for contemplating the relationship between dress, society, and our shared history. 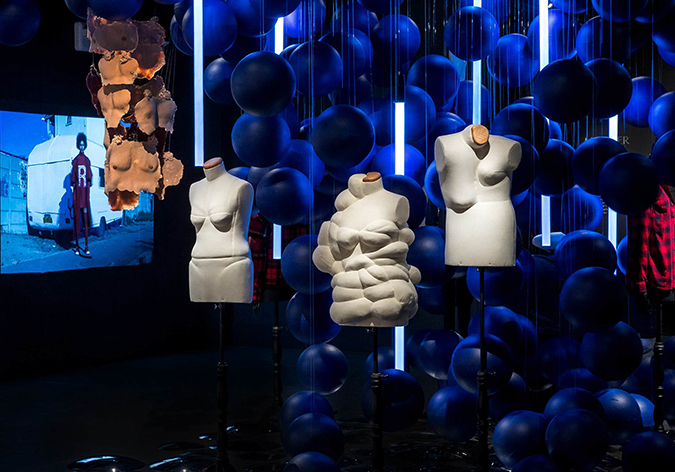 Objects from the following designers and artists were exhibited: 69, Adidas, Alexander McQueen, Anrealage/Kunihiko Morinaga, Arvida Byström & Maja Malou Lyse, Ashish, Bea Szenfeld, Bourgeois Boheme, Carcel, Chan Luu, Charlie le Mindu, Chromat, Cindy Hsin-Liu Kao & Jimmy Day, Comme des Garçons, Cooper & Gorfer, Cutecircuit, Daan Roosegaarde, David Lachapelle, Diana Scherer, Fantich & Young, Gianfranco Ferré, Gucci, Gypsy Sport, Hassan Hajjaj, Herdentier, Hideki Seo, Iris van Herpen, Jalila Essaïdi, Joanne Petit-Frère, Jordan Askill, June Canedo, Keta Gutmane, Louise Linderoth, Maison Martin Margiela, courtesy of Maison Margiela, Maja Gunn, Maiko Takeda, Maïmouna Guerresi, Michael Drummond, Minna Palmqvist, MuSkin, Omar Victor Diop, Pam Hogg, Prada, Raúl De Nieves, Reformation, Rich Mnisi, Sandra Backlund, Serena Gili, Slow Factory, Tabitha Osler, this is Sweden, Tommy Hilfiger, Viktor&Rolf and Vivienne Westwood. A Queen Within highlights a broad range of designers—from the internationally famous to the currently emerging—resulting in a deep inquiry into the diverse nature of the feminine. Gowns, wigs, shoes, and photographs are presented in immersive environments rich in symbolism, inviting visitors to peer into the private worlds of the deeply powerful feminine figures.